The Definitive Edition is a free update to the original game featuring additional content, balance changes, rewritten dialogues, an overhauled Arena mode and more. Editor available, Steam Workshop support. The Classic Edition is included and can be selected through the launcher. To launch directly into the game, create a shortcut to either <path-to-game>\DefEd\bin\EoCApp.exe (Definitive Edition) or <path-to-game>\Classic\EoCApp.exe (Classic Edition). Saves made in the Classic Edition are not compatible with the Definitive Edition. 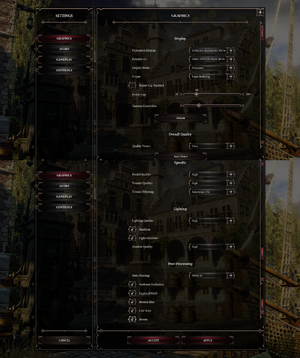 Use Better Camera 2 for DOS 2. No frame rate or refresh rate cap by default. Optionally frame rate cap can be enabled from the options. Fully remappable. You can use up to two different keys per task. Input or mouse/keyboard mode can only be selected at the start screen by pressing the corresponding button. Can be adjusted or disabled. 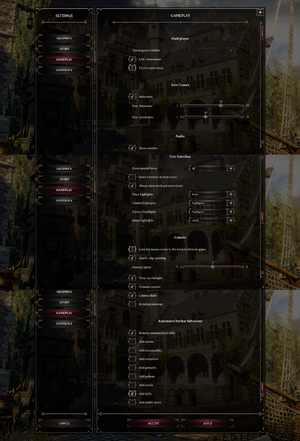 With controller input selected, some keyboard shortcuts still work. FX, music, ambient, fight music, UI, voice and cinematics. Can be changed in the audio settings. GOG and Steam users can play together. Can only be played in controller mode. 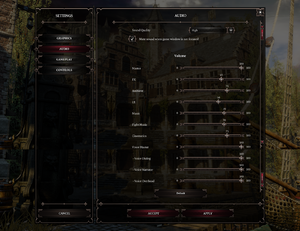 See Helix Mod: Divinity Original Sin 2 - Fix Update (patch v3.0.190.74) - Classic and Definitive Edition. A list of common problems and solutions can be found in the Technical Support FAQ. Mods for the Classic Edition are not automatically compatible with the Definitive Edition. GOG users can download Steam Workshop mods via Steam Workshop Downloader. The Classic Edition files (<path-to-game>\Data\) can be deleted to free up roughly 30 GB of space. Nvidia GPUs are not supported at this time and will likely result in graphical distortion or artifacts. ↑ 1.0 1.1 File/folder structure within this directory reflects the path(s) listed for Windows and/or Steam game data (use Wine regedit to access Windows registry paths). Games with Steam Cloud support may store data in ~/.steam/steam/userdata/<user-id>/435150/ in addition to or instead of this directory. The app ID (435150) may differ in some cases. Treat backslashes as forward slashes. See the glossary page for details.